At the age of 13, my Bagpiping journey started. I was in the 8th grade at Sandburg Jr. High, being taught to play the practice chanter by a Glendora High School Bagpiper. As planned, I proceeded to join the GHS Pipe Band the following year. My 11th Grade in high school brought on more responsibility with the Pipe Band, as I was chosen by the High School Band Director to lead the Pipe Band as their Pipe Major. This role continued until I graduated from the High School in 1996. As the High School does not allow for continuous participation in the Pipe Band after graduation, I moved onward and upward by joining the Cabar Feidh Pipe Band, which coincidentally rehearsed at GHS on Sunday mornings. As I continued with piping, college, and working part time, it became more and more challenging to keep my priorities in order. I decided to give piping a break, until I got a better hold of my college life. Returning back to piping about a year later, I discovered that it was still just as difficult to maintain a balance between the three. 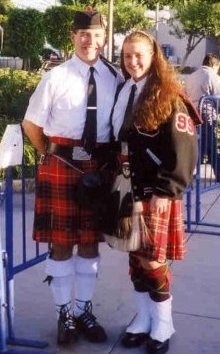 Once again, I cased up my pipes for band functions, playing only solo gigs and private functions until I tried again in late 2002, joining the newly formed L.A. Scots (Grade III) Pipe Band, up until it disbanded very shortly into the 2003 band competition season. As it had shown, being in a pipe band while attending college was not in my life plan. As time had repeated itself, back in the case they went. Finally, in October 2006, only 4 months after graduating from college, I joined the newly formed Pasadena Scottish Pipes and Drums. To this day, I have been with the band, and have been fortunate to partake in many band function, including travels to Scotland to compete in the World Pipe Band Championships. Above all, I am grateful for the path that life has taken me down. 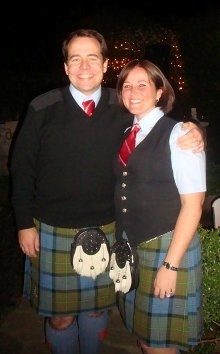 My wife, Melissa, had joined the GHS Pipe Band as a means of getting to know me way back when. So Bagpiping isn't just a hobby, it's a memento. Since I know how important it is to have something unique in life, I hope to be able to pass that type of memento on with my talent.